On a guided tour we passed the Freedom Monument in Riga. Our guide told us about the history of that monument and made us smile. 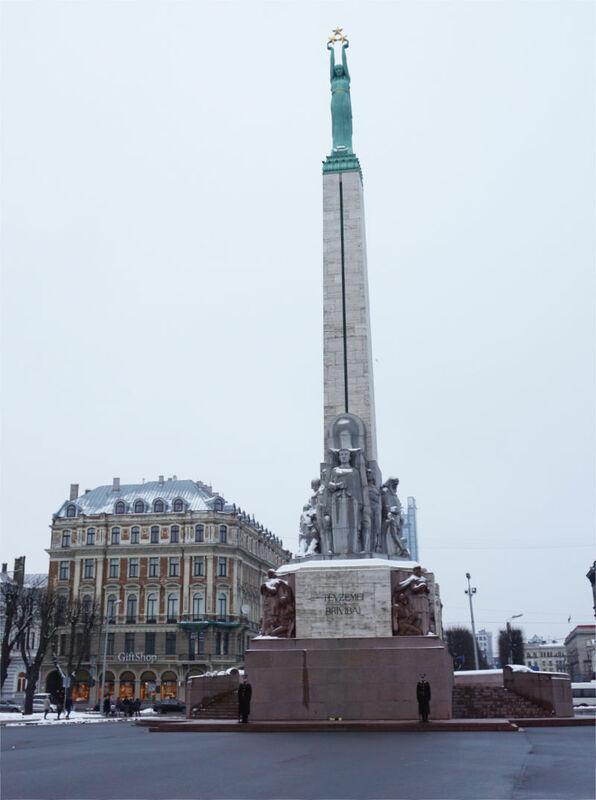 In a pedestrianized area in central Riga, the Freedom Monument stands 42.7 meters tall. The monument is guarded by two Guards of Honour who occasionally march up and down the front of the monument. They are accompanied by a lone soldier (who stands a little to the side and watches them). Visitors of the Latvian capital briefly stop and take some pictures before they tick this landmark off their list and rush to their next stop. It is a bit sad that only a few visitors have a closer look. On the spot where the Freedom Monument is now, there used to be an equestrian statue of Peter the Great. During the times of the first Latvian Independence, it was moved to put the Freedom Monument there. 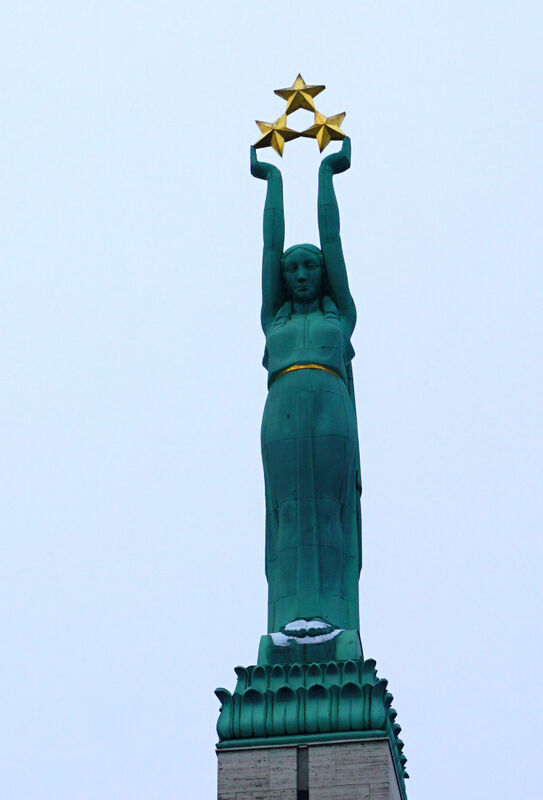 A Latvian sculptor designed the monument, which was inaugurated on the 18th of November 1935. Construction took four years. Different sculptures are placed on four different levels and all carry a specific meaning. The lowest level stands for the work ethics of the nation, its intellect and its desire for freedom. The middle level represents the ideals of the people and their wish to be free. On an obelisk made from granite stands a bronze woman with three stars above her head. A symbol for unity between the three different Latvian cultural regions. The monument was exclusively paid for by donors. The monument survived both the German and the following Soviet occupation despite its intense symbolism for the Latvians. Especially for the Soviet occupiers, the monument became somewhat of a thorn in their side and towards the end of WWII they even planned to explode it. It is said that the monument was classified as unsafe for the surrounding traffic. 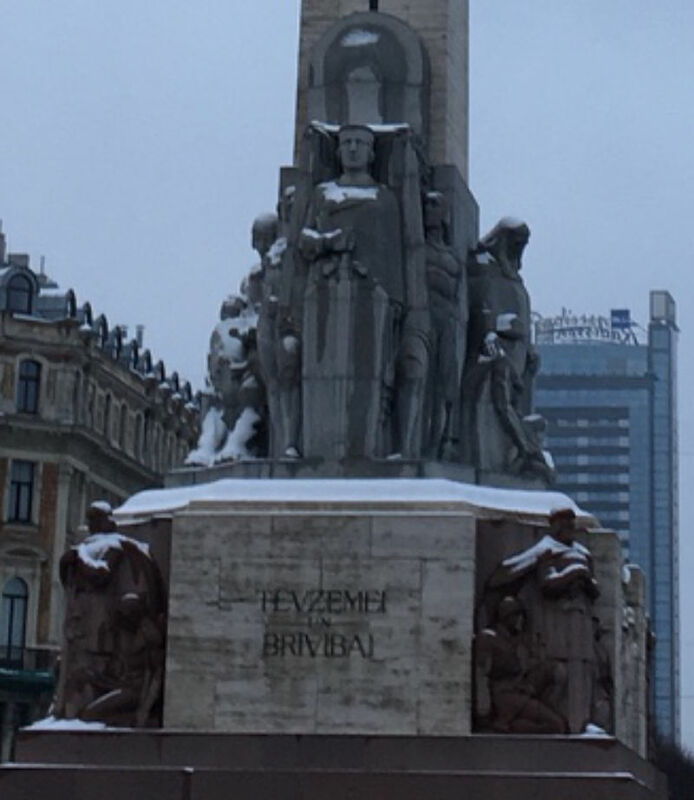 In response, Riga’s Mayor transformed the surrounding area into a pedestrian zone and saved the monument. It is supposed that there was never an actual danger for pedestrians from the allegedly run-down structure. The story that we were told is somewhat more believable. Throughout the years of the Soviet occupation, any gatherings at the statue were prohibited. As the Perestroika began the confidence of the Latvian people changed and gatherings and discussions beneath the monument became frequent occurrences. Today, state visitors are received here and it also a venue for festivals and a beloved meet up spot for the locals.